Before I got braces, I really really wanted them. I also wanted glasses and a cast (preferably arm, but I would have made do with a leg). I’m sure any therapist worth his or her $200 an hour fee would tell you what I really wanted was attention, even in the form of teasing and taunting, but because I went to a school full of nerdy people–even the coolest kids crammed around our old school Apple computers and played Oregon Trail at lunch–having braces and glasses would barely have gotten me noticed. Unfortunately, thanks to all the carrots I ate, my eyesight was 20/20 (although I did try to fail an eye exam, but took it too far and had a very alarmed school nurse thinking I was legally blind) and I was never adventurous enough to break an arm, but luckily my teeth were a mess. I’m sure there was a bidding war in the back of the orthodontist’s office to fill my mouth with metal. I mean, at one point there was talk of breaking my jaw to align my teeth. So, months before turning 14 I got my wish for braces and they were all I hoped for. That is, of course, until I was approaching my 16th birthday. What almost 16 year old wants braces?? I threatened to remove them myself if Dr. G didn’t take them off for me. I even convinced the man to up the ante in the months leading up to my birthday by removing the wires and giving me a mouth guard to speed up the process (I, of course, did not think of the fact that the mouth guard would prevent me from talking, which I’m sure is why he went for it. Luckily I only had to wear it while I slept). Anyhoo. The braces came off days before my 16th birthday and the first thing I wanted was a caramel apple. Obviously they were verboten while I had braces, but even before I’d never been able to eat one right off the stick, because my top and bottom teeth didn’t meet in the middle (you thought I was kidding about how crazy they were, didn’t you??). I always had to cut them up, which really defeated the purpose. So, I wanted to bite into a caramel apple and drink sugary drinks and eat Cheetos to my heart’s content. I was totally foiled though, because my birthday is in July and there was nary a caramel apple to be found. 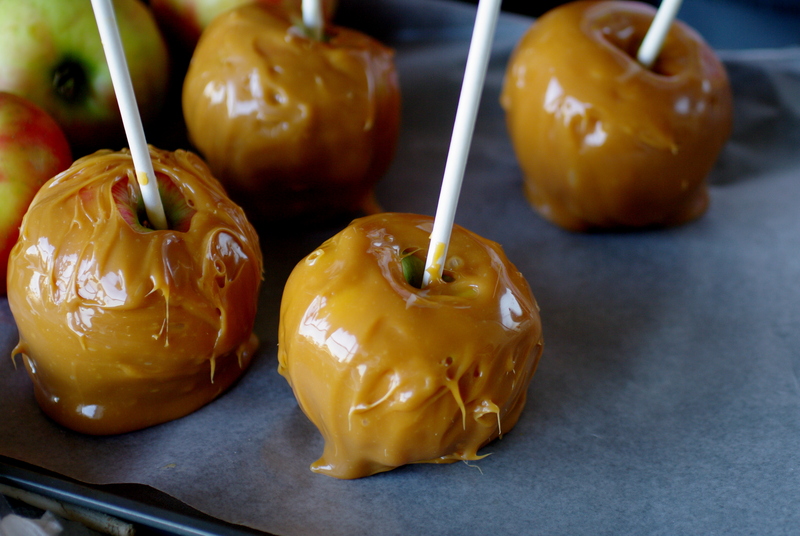 But I kept my dreams alive and at the first whiff of fall I went in search of caramel to make my own batch of apples. This is where the shininess of youth starts to color your recollections, because as I remember it all I had to do was melt the caramel, dip my apples in, let them cool and voila! Happiness at my fingertips. This go round? Not so much. 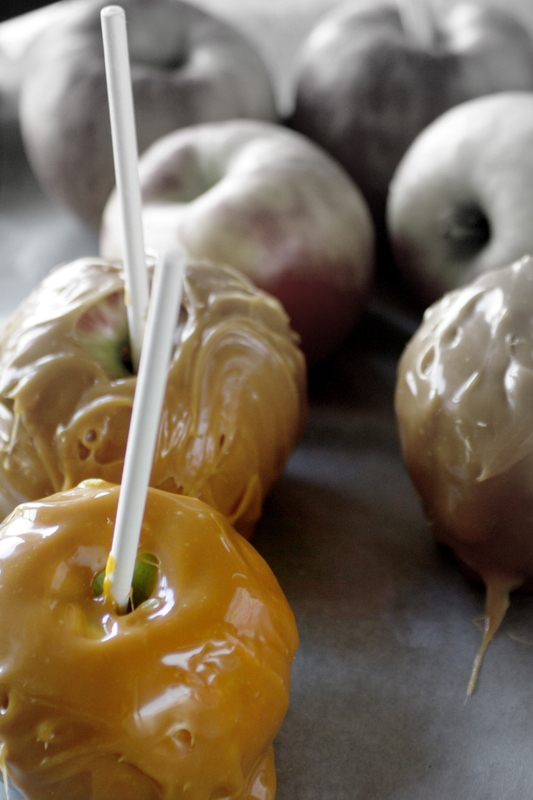 First of all, there were no sticks in the bag of caramel like I remember, so I had to schlep to Michaels (usually a happy experience, but I was on a mission) and then it took me forever to actually get them in the apples. 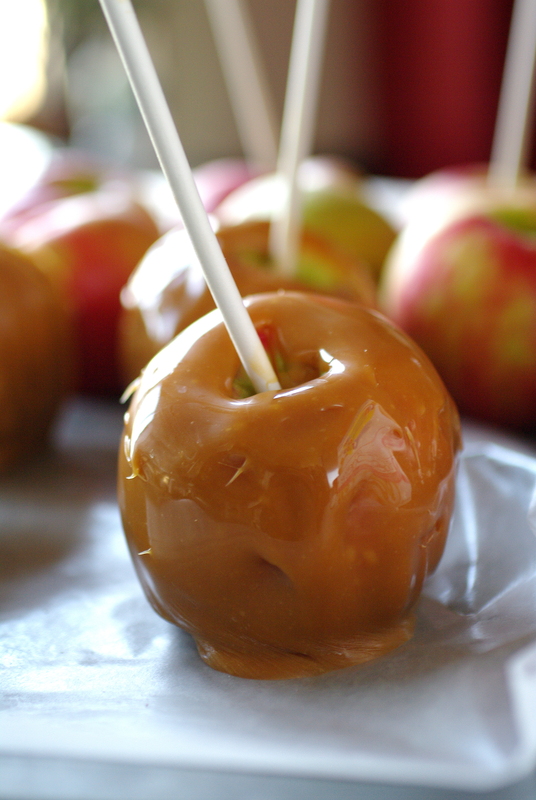 As for the melting of the caramel, I admit that I didn’t follow the package directions completely–I used a double boiler instead of melting it down–but I really don’t remember nearly getting third degree burns while dipping the apples. 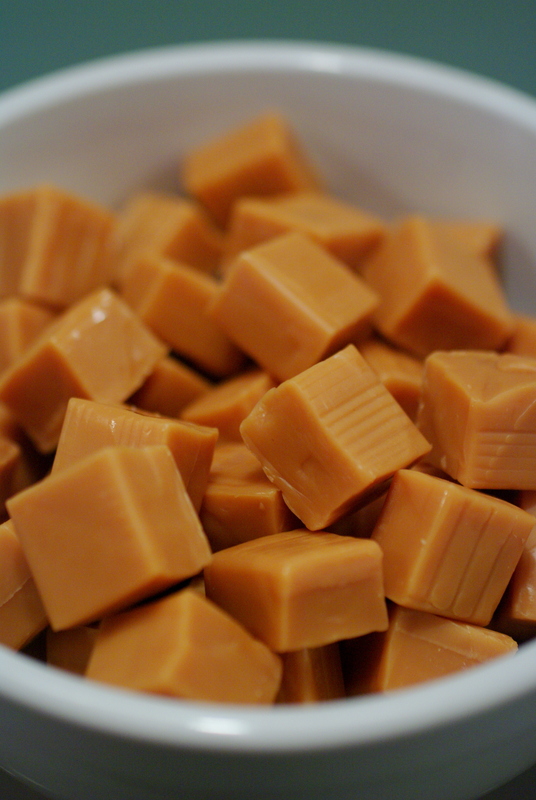 Melted caramel is hot, kids! You heard it here first. 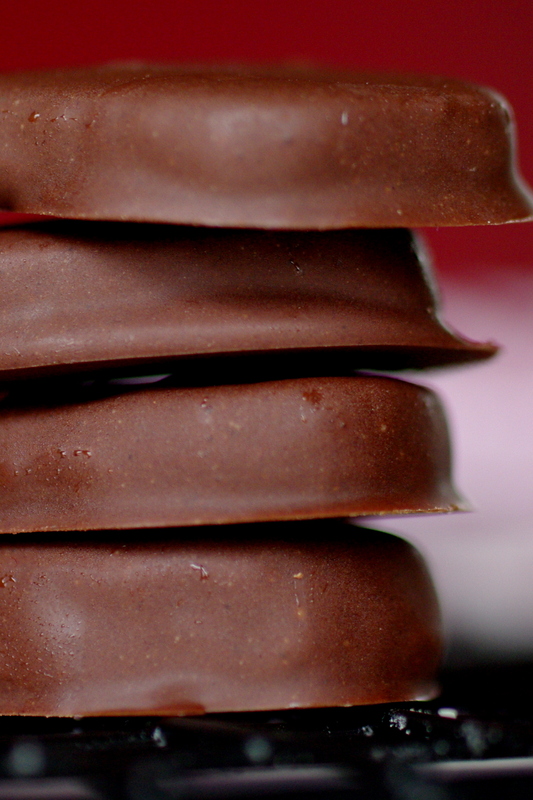 We’re going super simple on the recipe today. Follow the directions on the back of the bag of Kraft caramels. Don’t be foolish (like me) and try to invent your own. After an unfortunate run in with some not so happy cold cuts, there has been little but broth, dry toast, crackers and ginger tea/ale cooked or eaten chez moi. I have watched 11 episodes of Law & Order since Monday (which is fine with me, given that the theme song is my ring tone), but I’m just about done with all of the commercials for weight loss supplements, car insurance and shady law firms. I did, however, discover that when starved of anything tasty, I will actually crave Red Lobster followed by a Taco Bell chaser (those commercials are shown ALL. DAY. LONG.). Not sure what to do with that info, but there you have it. I would also like to try this place called Cici’s or something that has a $4.99 pizza buffet; from the commercials, it appears they have a mac & cheese pizza… Can you tell I need to get out? Anyhoo. It is well known in my family that when you’re sick, the ginger tea comes out. Powdered ginger will do, but if you really want to feel better quickly, you have to get fresh ginger, cut it up, smash it down a bit to release some of the oils and then add boiling water. After drinking about 18936574 cups of tea over the last few days, though, I really couldn’t imagine drinking one more, but I still wanted the benefits of the ginger. 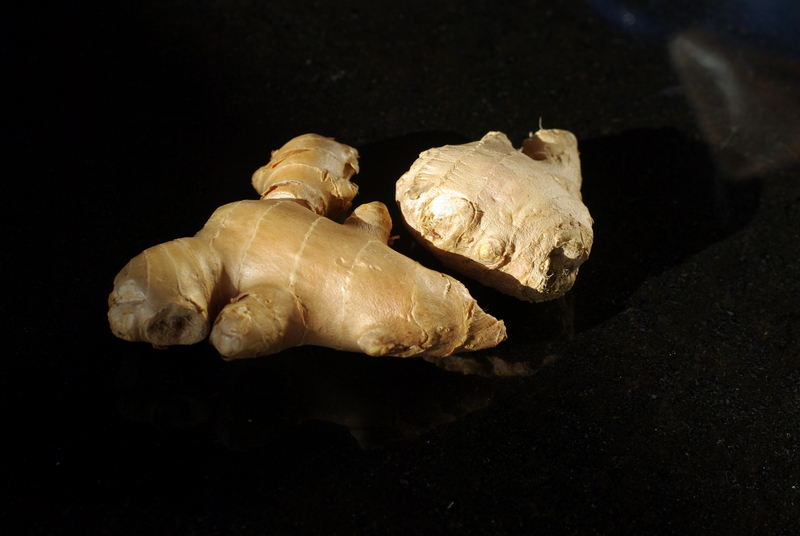 I’m not sure if you’ve ever chewed on raw ginger, but it’s akin to gnawing on bark rolled in chili pepper. I wouldn’t recommend it. But what could I do with all of the ginger my mother had brought me without having to actually cook? And then it occurred to me that I hadn’t had any sugar in days and I was starting to get twitchy (don’t even talk to me about the lack of coffee and chocolate). 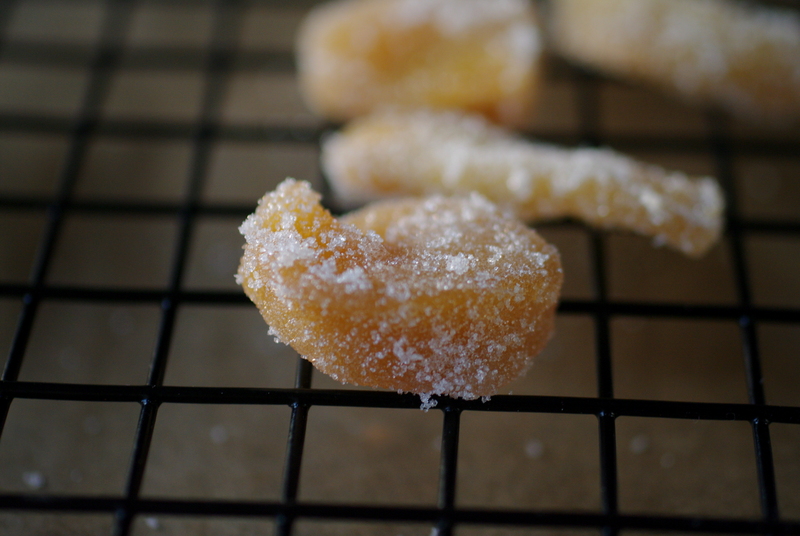 So candied ginger seemed like a good way to go. There didn’t seem to be a recipe out there that had less than 7 billion steps, but I settled on Alton Brown’s because it was the most straight forward. 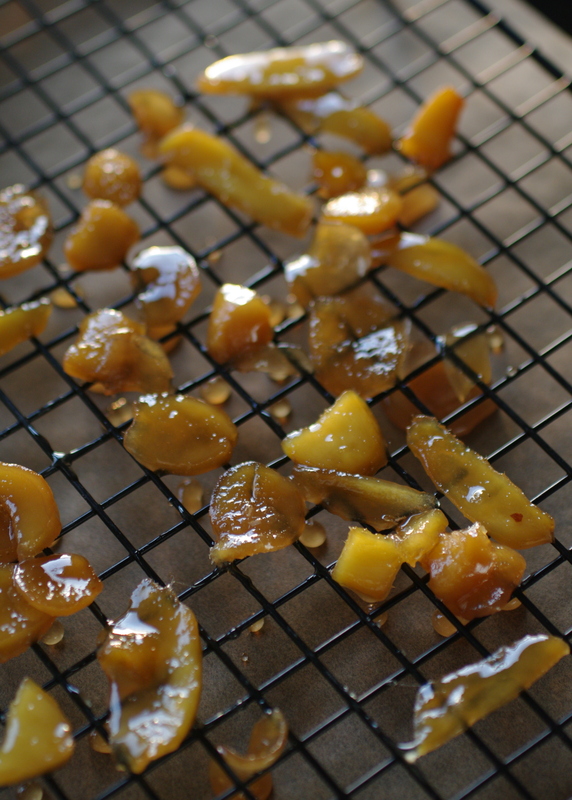 And I have to report that all the happiness of the ginger tea, but with the added goodness of the syrup, is found in the candied ginger. It’s still spicy, but the syrup softens the sharpness a bit. I did one batch with an extra sprinkle of sugar, and I actually–shockingly–like it better without, which only means that over the last few days I’ve lost my mind and possibly some of my taste buds. I am feeling so much better that I actually turned off the tv for a bit in the middle of a Law & Order episode that I’d already seen 3 times. Next step is getting out of the pajamas. Was that an overshare? Peel the ginger root and slice into 1/8-inch thick slices using a mandoline (I used a sharp knife and my slices were not the least bit even, which I think is more fun). 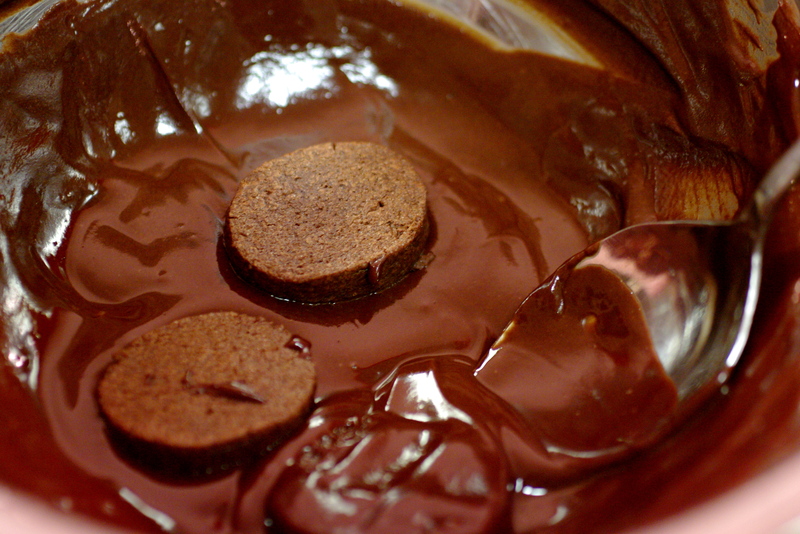 Place into a 4-quart saucepan with the water and set over medium-high heat. Cover and cook for 35 minutes or until the ginger is tender. Transfer the ginger to a colander to drain, reserving 1/4 cup of the cooking liquid. Weigh the ginger and measure out an equal amount of sugar. Return the ginger and 1/4 cup water to the pan and add the sugar. Set over medium-high heat and bring to a boil, stirring frequently. 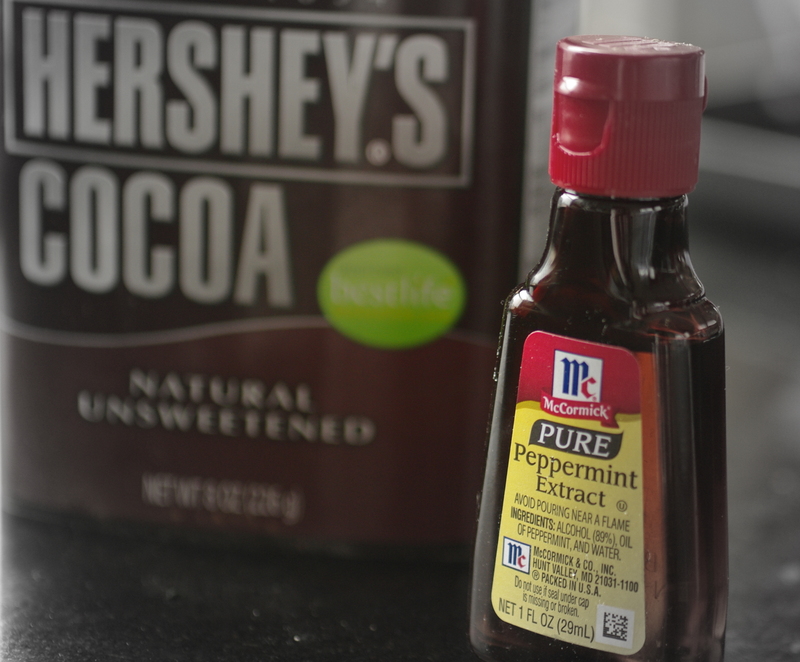 Reduce the heat to medium and cook, stirring frequently, until the sugar syrup looks dry, has almost evaporated and begins to recrystallize, approximately 20 minutes. 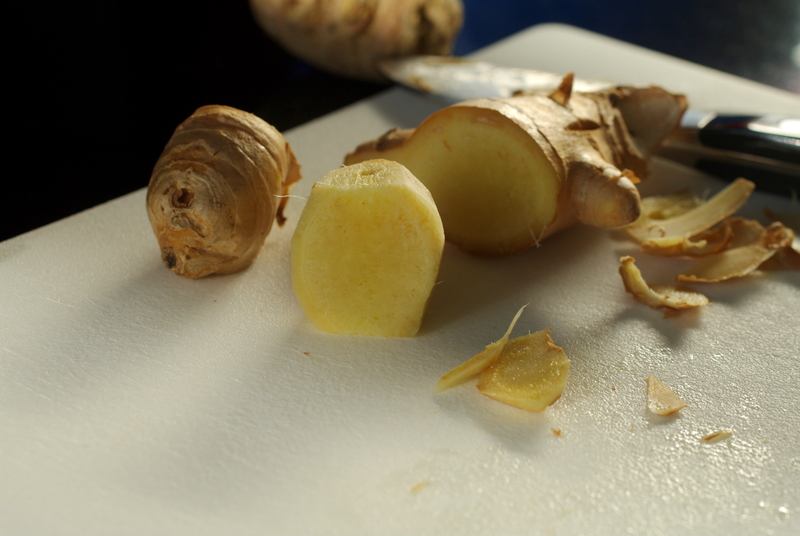 Transfer the ginger immediately to the cooling rack and spread to separate the individual pieces. This is where you’d want to dredge the pieces in granulated sugar, if desired. Once completely cool, store in an airtight container for up to 2 weeks. 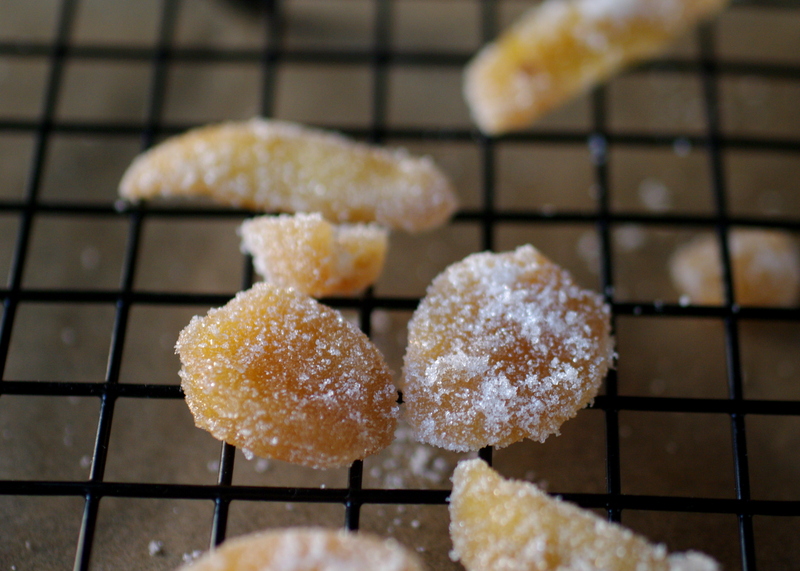 Save the sugar that drops beneath the cooling rack and use to top ginger snaps, sprinkled over ice cream or to sweeten coffee (oh, how I miss you, dear coffee!). I have this obsession with State Fairs. Shall I start from the beginning on that one? My good friend Michelle, who used to write with me here (and who we hope comes back one day!) 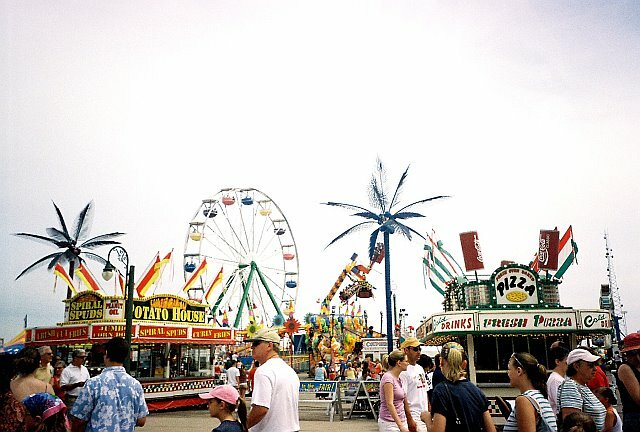 moved to Milwaukee several summers ago and both of us being city girls thought that the idea of a state fair sounded like one of the most fun things ever in life. 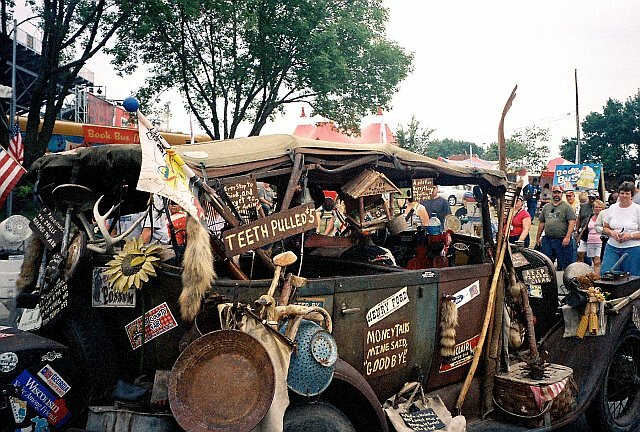 We’d never been to one, and the fact that Wisconsin’s fair is in the middle of Milwaukee made our little city hearts happy, because we’d get to experience this decidedly un-urban thing without getting too far out of our comfort zone. If you haven’t ever been to a state fair, I really suggest you find out where yours is taking place this year and head on out, because, honestly? Best thing ever. Besides the rides, games and odd mix of mullets and leather jackets, the amount of food that is available is astonishing. Corn dogs, cotton candy, fresh milk, cream puffs, every flavor of beer imaginable, cheese curds, elephant ears, candy apples… And that’s just at the entrance. Once you get into the fair, there are entire pavilions dedicated to food and drinks and things that I didn’t know you could eat (crocodile, anyone?). What really gets me is that each fair is a total love fest for the state (I recognize that is a completely obvious statement, but until you’ve seen an entire barn the size of a two football fields dedicated to Wisconsin dairy products–including 3 different grilled cheese stations–you really don’t get it). I hear that Iowa has a huge cow made out of butter for the love of all things good! So, kettle corn is the most tame of anything you’ll find at the fair, and to be honest, I don’t know that it even made my list of things to taste, but when I buy it in the store (at an outrageous $5 a bag. Seriously?? ), reference is always made to how it’s the ultimate in state fair fare. 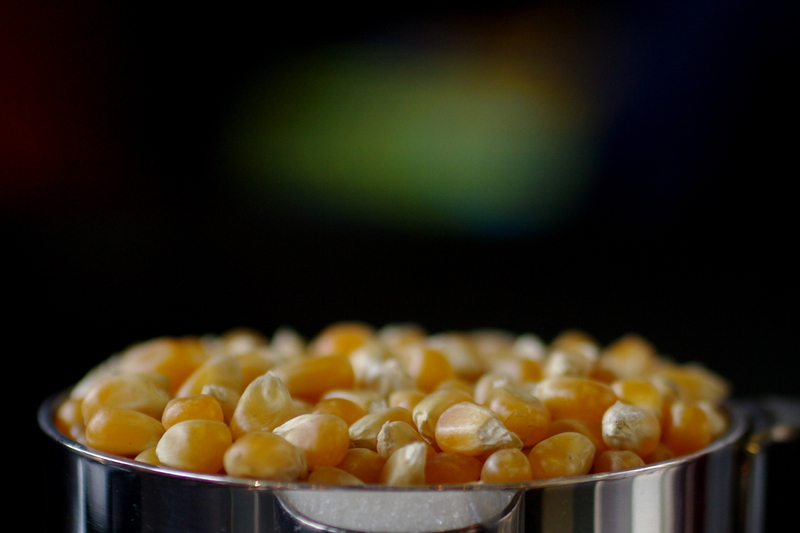 Since I grew up in the era of Jiffy Pop, I’d never actually made popcorn on the stove with loose kernels. That, and the fact that I was always afraid that a stray kernel would take an eye out. But I was staring at a bag of yellow kernels the other day (ok, I’ll admit I was debating the merits of having popcorn for dinner. High in fiber! Low calorie!) 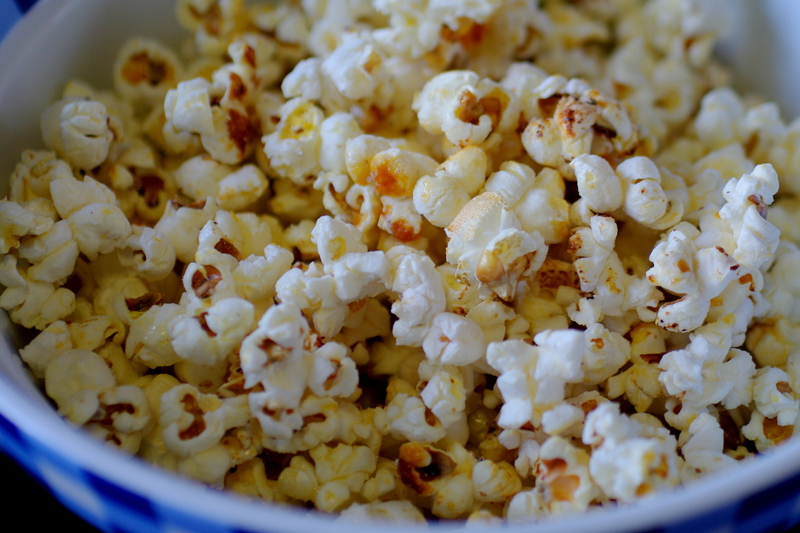 and I thought it’d be good to be able to make my own kettle corn for those times when it’s late at night and I’m on a sweet/savory merry-go-round. Lucky for me, it’s super easy and although I did fear losing an eye at one point, all turned out well in the end. In a large pot with a tight-fitting lid, heat the oil over medium-high heat. Add the popcorn. 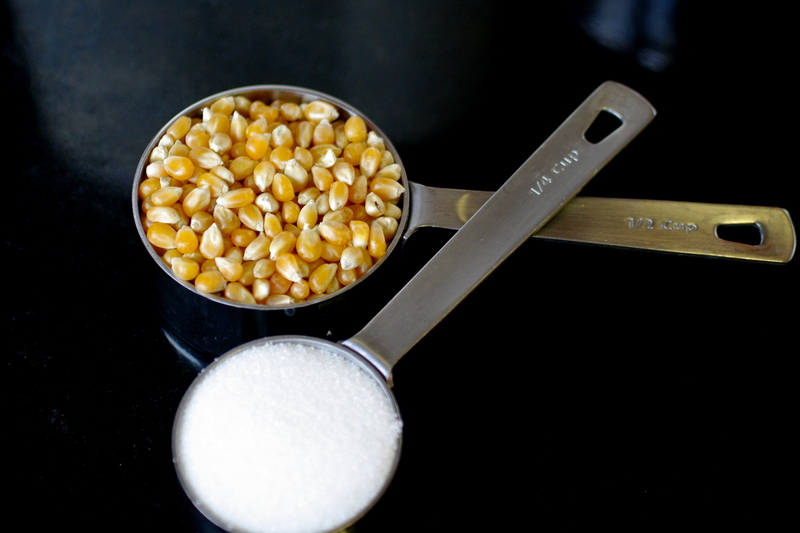 When the oils sizzles, sprinkle the sugar over the kernels. Cover and shake the pan until the popping slows down, about 3 minutes. Remove from the heat and toss with the salt. Back in the day when I was a Girl Scout (Troop 348! Holla! Or was it 346? ), we were expected to go from door-to-door peddling our thin mints and Samoas. I would don my green skirt, green and white striped shirt and green sash with all of my badges and head to my mom’s office after school, where I would politely knock on people’s office doors and recite my speech about supporting our troop through the purchase of what amounted to a box full of sugar. I would make chitchat while people filled in the sheet with their order and address and thank them with a toothless smile (I was 8 years old) as they dug in their wallets or pulled out their checkbooks (no CODs for this Scout!). I would then hand deliver their cookies when they arrived. At any rate. Times have changed, kids. Now, I get emails from parents asking me to purchase their daughter’s cookies or facebook updates asking for orders and even worse, it appears I can now buy my cookies online. I realize that there are all kinds of creepy characters in the world nowadays, so going door-to-door isn’t the safest option, but I think part of the idea behind selling cookies–besides funding our weekend at Girl Scout camp–was to teach us to be independent and confident and, at the very least, how to convince people to buy stuff they didn’t actually need (a useful skill, I think). I’m not quite sure what the lesson is when the parents are doing all the selling, money collecting and delivery. Actually I do know, but I’d rather not think about it. Where was I? Cookies! That’s how all of this started!! 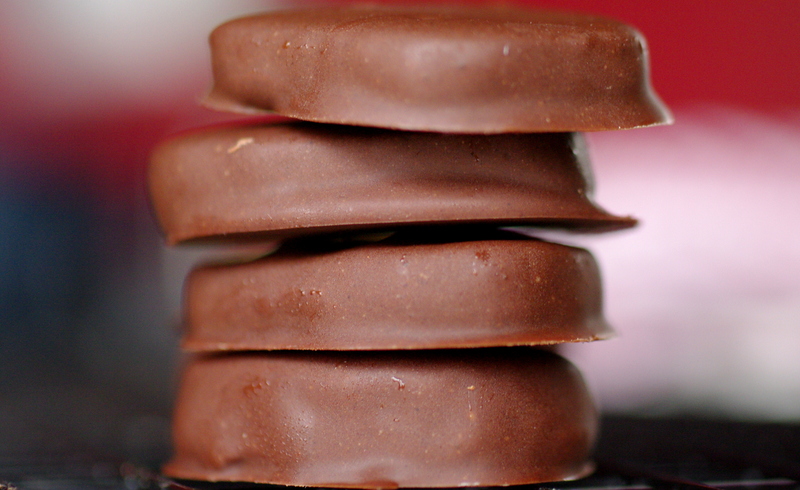 So Thin Mints were my–and just about everyone else’s–faves. Anything that combines mint and chocolate is going to make my top 10 list, but I also loved that there was a little bit of saltiness to the cookie, which made it different from other chocolate/mint combos. I am under no illusion that anyone can replicate the Girl Scout Thin Mint, but someone put out a box of them at work the other day and I had this thought that until some Scout comes and asks me to purchase cookies in person, I am totally boycotting the cookie sale season and will make my own until these girls start knocking at my office door or at least write the parent sent emails themselves. And yes, I do realize that I am depriving young girls of much needed cookie income, as well as the fact that I have also deprived myself of some happiness in a green box. But revolutions are all about sacrifice. Last week, one of my closest and dearest friends, Kala, sent me a food challenge. I point out that she is one of my closest and dearest friends—we have known each other since we were 11—because when she told me that she wanted me to help her find a tasty way to make quinoa, I absolutely wanted to make the best quinoa ever in life because I love her dearly. When she then told me she had never actually had some that tasted good, I got a little nervous, because I really didn’t want to disappoint her. When I started looking up recipes online that described quinoa as “nutty,” “crunchy,” “a super-food” but never “delicious” or “yummy,” I started thinking that this was going to be a little harder than I thought. 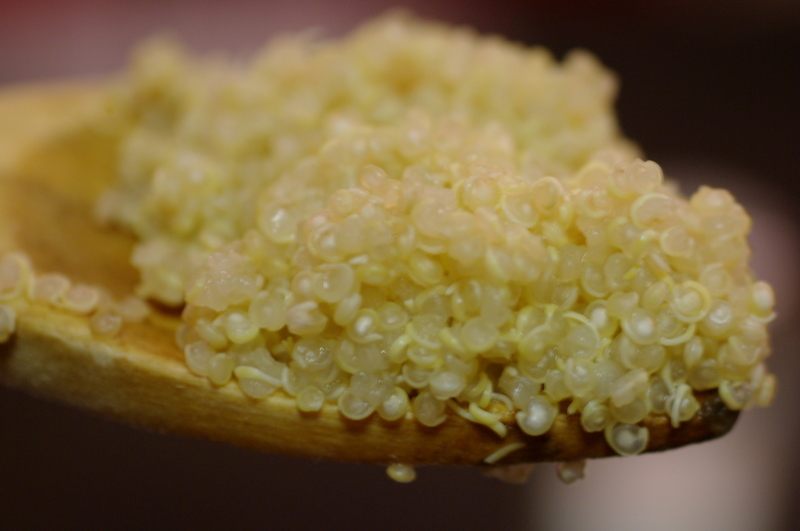 But it wasn’t until I asked another friend what she thought of this ultimate protein and she said, “it’s kind of like couscous, but it has these little tail things,” that I thought that disappointing one of my closest and dearest friends was really not that big a deal. I’m sure that Hallmark even has a card to make up for it. Since I have been at a loss for cooking ideas lately, and as the days ticked by without the slightest bit of inspiration, a quinoa pudding started to sound better and better (or at least the idea of it. Kala and I decided that I’d try to make a variation on rice pudding since she wanted sweet over savory). I really think it’s difficult to screw up anything that has sugar, cinnamon and vanilla, but I also thought that if anything could, it would be some kind of grain with a tail (I really hoped that that part of the description was an exaggeration, but there it was right on the package—although what my friend called tails are technically called “germ rings.” Even better…). I’ve had mixed success with about five rice pudding recipes I’ve tried: either the rice was too hard, too soft, not sweet enough, blah blah blah, so I knew I’d have to find a recipe specific to quinoa, since I wasn’t familiar with its texture or taste. Surprisingly, there were a number of good ones out there, which means more folks have jumped on the crunchy-almost like couscous-but-with-a-tail bandwagon than I knew (can you tell that I really can’t get over that tail/germ thing?? I mean, really. It’s just too much for me). All of the recipes I found online said that the quinoa needed to be picked over and separated out and washed thoroughly in unicorn tears, which sounded way more complicated than I really could be bothered with. Luckily Trader Joe’s sells boxes of it and I’m going to hope that TJ did all of the hard work for me. So I open the package and it was literally like putting my head in damp soil, which, since this is a food blog and all, is not the best description for something I’m trying to encourage you to make, but that’s what came to mind and I’m all about honesty here (wait! 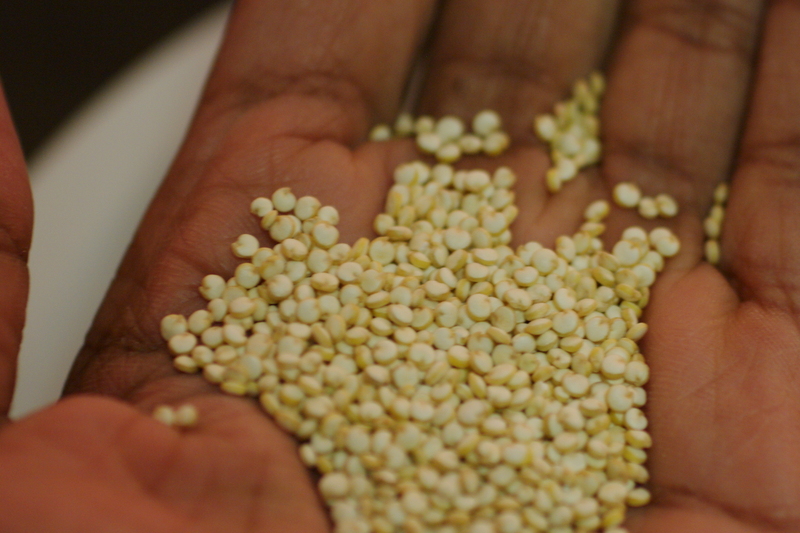 Perhaps I should cut to the chase and tell you now that it turned out to be super tasty, so that all of this lead up doesn’t have you swearing off quinoa and its goodness before you even try it. It was yummy! I promise!). Needless to say that as it was cooking, the earthy smell intensified to the point that when it was ready I said out loud, “I really don’t want to taste this,” and had an internal debate about how on the one hand I really enjoy this blog, but on the other, I’m not prepared to eat just anything for the sake of coming here to tell you about it. 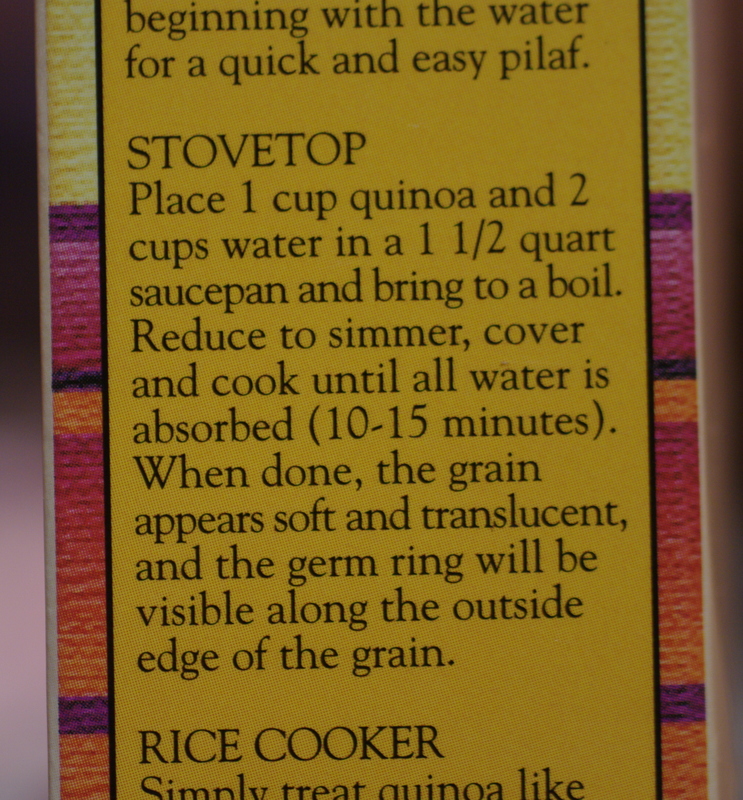 But my New Year’s resolution to commit myself to this little endeavor won out, and I tasted about three grains. And they were crunchy. But! Also kind of bland and inoffensive (again, strange words to use to describe food, but that made me realize I could work with it). Even though I knew the sugar, coconut milk, cinnamon and vanilla mixture was going to work, I really didn’t expect the recipe to turn out as well as it did. I mean, I had to walk around my apartment for a good 5 minutes after it came out of the oven humming the theme to Rocky to gear myself up to taste it. 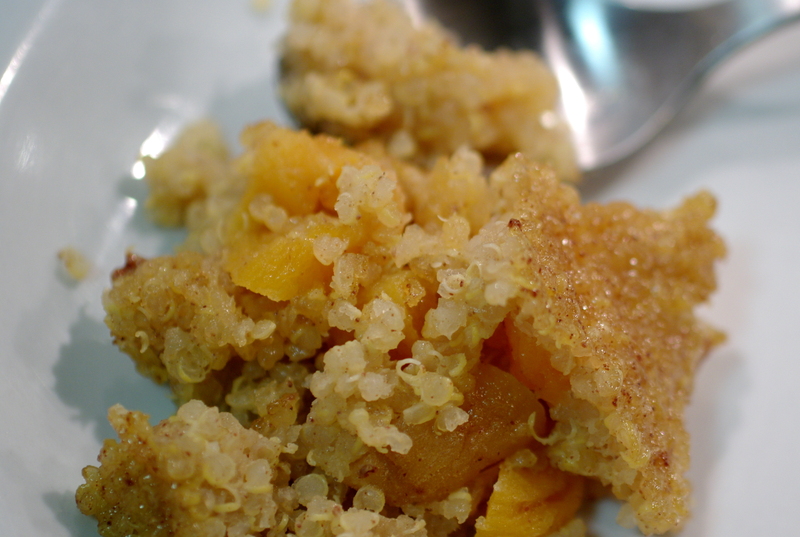 And I’m really happy I did, because it was sweet and creamy, with a lightness that made it more appealing than rice pudding, which I love, but will totally cheat on with this quinoa pudding. I actually had to convince myself to move away from the pan so there’d be some left for pictures. And, it was even better the next day when all the flavors had soaked in and it was room temperature. I’m always looking for new recipes to test and make part of my go-to list, which in reality means that I’m always finding recipes and filing them away and then making myself feel really guilty for not trying them. This was bad enough years ago when Food Network only showed Emeril Live and Ming Tsai and when epicurious.com was just a glimmer in Al Gore’s eye and I had to clip recipes from magazines, but now with the explosion of all of these cooking shows (have you ever watched Cake Boss? I have a ridiculous crush on Buddy and his ability to make cakes in the shape of anything under the sun) and food websites, the countless recipes and ensuing guilt just about swallow me up. [insert deep dramatic sigh here] I have about 200 recipes I’ve been meaning to try (this does not include all of the cookbooks I’ve used one or two times). 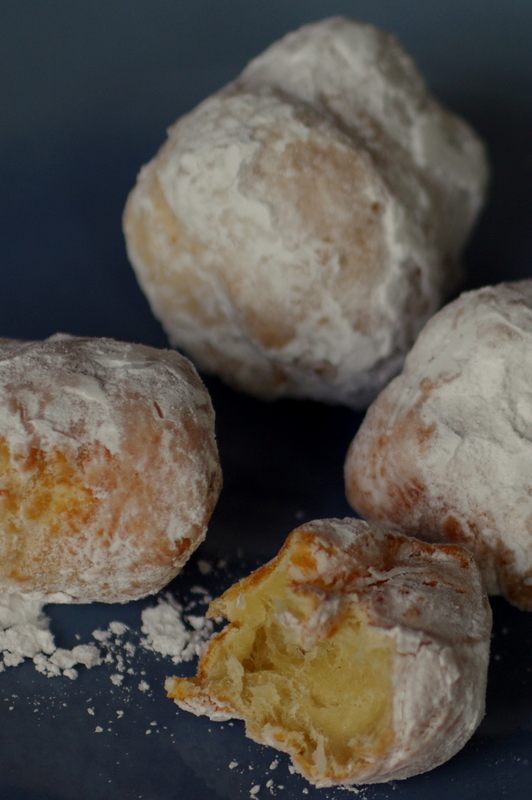 I watched Giada De Laurentiis make doughnuts sometime last winter, and I never had any occasion to try them until this weekend when I needed something tasty to take to a brunch with friends. I’m not a huge doughnut fan, which is odd since fried dough + sugar = 20 kinds of happiness, but Giada just made them look so fun! and easy! and so super cute! She used pre-made pizza dough to make doughnuts and doughnut holes and really, nothing could be simpler. 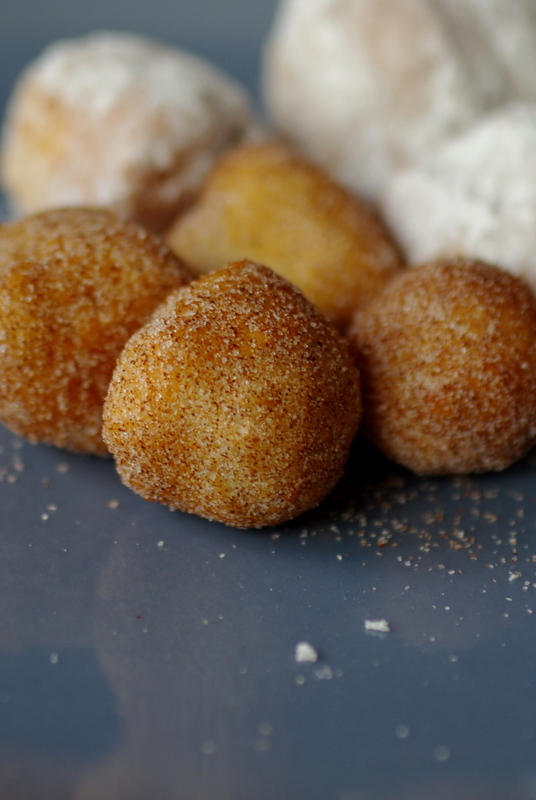 I did a test run of the doughnut holes on Saturday and the hardest part was not eating the entire batch in one sitting. 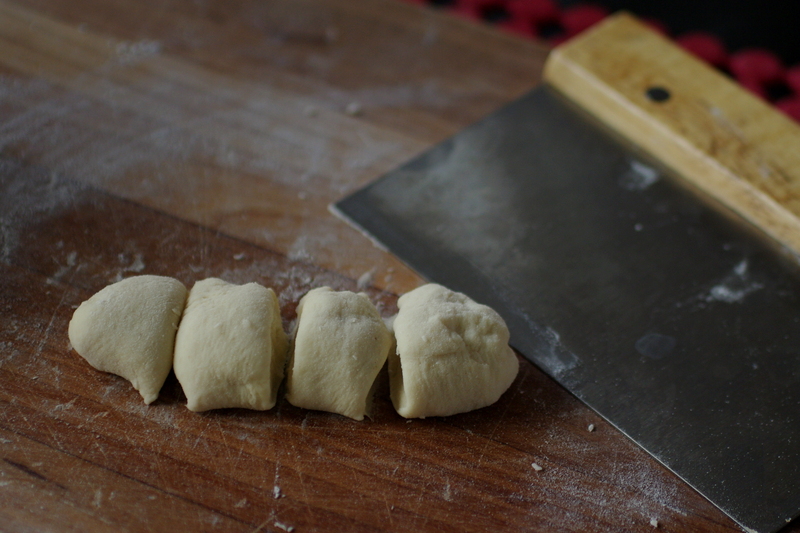 The fact that they are incredibly easy came in handy on Sunday morning when I made the real deal after spending a bit too much time gallivanting on Saturday night and got home oh, 5 hours before I needed to get up and start rolling out dough.